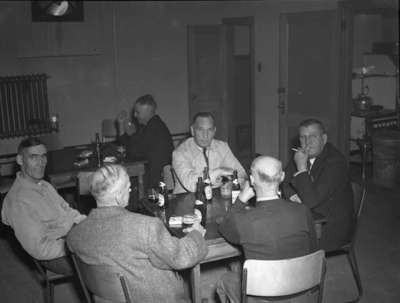 Six men from the bugle band gathered around tables socializing. Eric Clarke (1906-1966) formed the Whitby Brass Band in 1954. Under his direction, the Whitby Brass Band received several first prizes in Canadian National Exhibition (CNE) and Kiwanis competitions. Clarke also formed the Whitby Junior Brass Band and was a member of the Ontario Regiment Band. He was presented with Whitby's Peter Perry Award in 1956. Eric Clarke's Bugle Band, 1947, Marjorie Ruddy. Whitby Archives A2013_040_1111.